Stampin’ Up! Inspiration Saturday and a giveaway! Hello my friends, and thank you for inviting me to share on Stampin’ Up! Saturday! 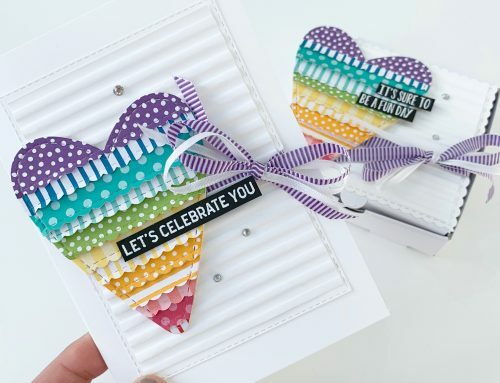 Today I have some really fun projects for you, all using the Cutie Pie Thinlits and the Big Shot. This die makes the most adorable pieces of cake. You could make just one, or several! These three cute pieces were made by the Concept Artists at the Stampin’ Up! Home Office. They are seriously sweet! The triangle shape of this thinlit sent my creative mind into overdrive as I thought of the many different triangle items I could make. I finally settled on three projects that I’m very excited to share with you. First up, the triangle shape of this thinlit is absolutely perfect for party hat favour. Can you imagine how thrilled your birthday party guests would be to receive this filled with treats as their take away? To create the hat I used the bold and beautiful It’s My Party Designer Series Paper, paired with the Party With Cake stamp set, and of course the Crushed Curry Baker’s Twine and Cherry On Top Cotton Paper make the perfect coordinating embellishments. Once I’d made the party hat, I was in the party mood! Next up, I was ready to play with this die to create some wedding decor and favours. Living so close to the Rocky Mountains, I have been invited to several mountain weddings, so with the mountain reception decor in mind I created these very modern and chic snowcapped paper mountains. Just a few extra snips with my scissors and some additional scoring, and I was able to create little mini mountains to accompany the full size one. And what’s some diy wedding decor without some diy wedding favours? I simply added a tag to the largest mountain to create glammed up mountain favour box. The Going Global stamp set and Going Places Designer Series Paper are the touch to a mountain theme wedding. After creating the mountains, I was thinking big! I wanted a bold statement piece that could be used at several different parties, that’s when this diamond was born! Using five die cuts that I altered with my paper snips and trimmer, I glued them all together to create a cardstock base, and then went to work adding the most blingy of fringe! Doesn’t the Silver Glimmer Paper make this hanging diamond a showstopper?! 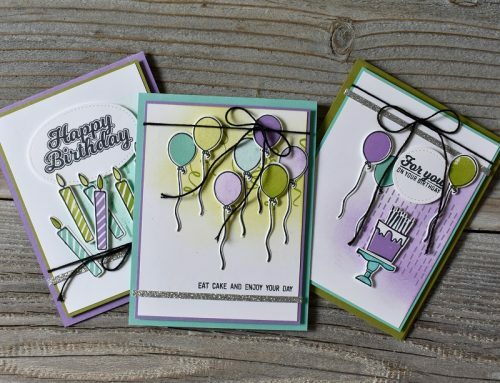 Thank you Allison for sharing the versatility of these amazing thinlit dies! As always our very sweet and generous friends at Stampin' Up! would love to share the dies that Allison used with one lucky winner! For an opportunity to win, be sure to leave a comment below by April 30th!!! Now let's see who won the Botanical Blooms prize package from March! Congratulations Karen! Please send us an email at catherine@scrapbookandcards.com with your mailing information and we'll send that right off to American Crafts! Thank you to our friends at Stampin' Up! and to Allison for sharing. Have a wonderful weekend and be sure to check out (enabler alert!!!) the latest Stampin' Up! catalogue too! wow—the possibilities are endless this set!!! 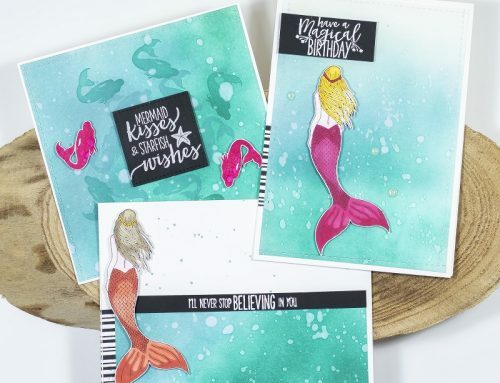 Stampin’ Up products are amazingly fun! love the designs! thank you for the wonderful chance! The cake slices look good enough to eat! Your imagination is your limit with Stampin Up dies and supplies. I love the mountains! Thanks for the opportunity! I love the “out of the box” inspiration! Great ideas to showcase the different ways to use the dies for those of us who have someone limited imaginations sometimes. Love the mountains! Those dies are so much fun! I love the “thinking outside the box” to come up with additional ways to use the dies. Stampin’ Up is just awesome, and thanks for the chance to win! Great die set. You have shown me so many uses for one set. Love the versatility and those mountains. Never would have thought to use these dies in so many creative ways. Love Stampin’ Up. Cool beans!! When I saw you “mountains” I thought of candy corn! Great set with tons of possibilities~ I really love your diamond! Shine on!! How fun! 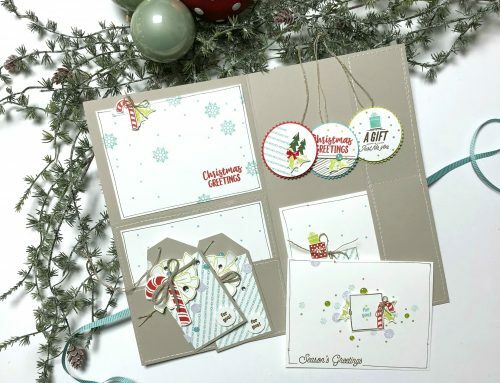 Stampin’ Up makes great products. The little boxes are a fun idea. What amazing ideas for the cutie pie package!! I never thought to stand it up on its end, or the way you turned it into the diamond ornament–how creative!!! Thanks a million for sharing! I love the 3-d birthday cake!!! So pretty! Awesome ideas for this set of dies! Love the cake slices! What a fun presentation for a gift! Love these dies from Stampin’ Up! They remind me of candy corn, so naturally, I need these by Halloween, lol. Thanks for the chance to win them. Ooh, I love these dies! I could have a lot of fun with these. Thanks for the chance. You’re projects are amazing Allison! Would LOVE to give these a try!!! Thanks for sharing with us! Oh my gosh, love how the cake turns into a party hat, mountain favours,and diamond bling! Smashing projects Allison O.!! What a fun, versatile set! Thanks for all the ideas and a chance to win! LOVE LOVE LOVE…would love to win! Want to make those cake pieces into mini pinatas…so many options for fun! Wonderful variety of projects with these dies. I have been looking for something like this to use for favors and lots of things. Would love to win it. Thank you for sharing your ideas as well as the chance to win this wonderful package. I really love how clever and unique Stampin’ Up! products are!! Love their dies and how cleanly they cut! Awesome projects in this post!! Thanks for the chance to win some great stuff!! I am a die aholic! 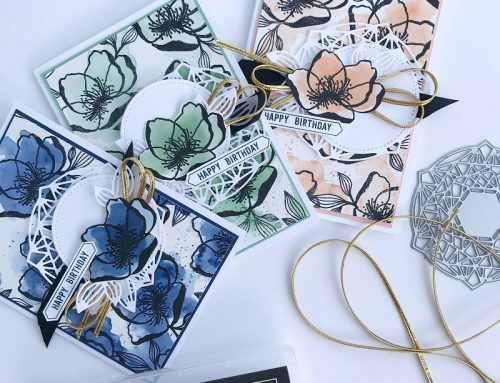 These projects show just how versatile the Stampin Up die set is. I am awed by the creativity from the one die set. I would love to win this awesome Stampin Up die set. Thanks for the chance to win! So creative! I’d love to put these to use for fun coworker treats! Thanks for the great ideas! Very cute. And as always, many great ideas. Thanks Stampin’ Up. Stampin Up is a wonderful company and one of my favorite sources for scrapbooking and card making supplies. I have only recently purchased a Big Shot and really need more dies for it. Thanks for the chance to win some! Oh…I just love all the projects with this SU die set! I would not have imagined all the fun stuff!! You really know how to inspire crafters using the Stampin’ Up dies! I loved the mountain treat favours! Thanks for showing us an out of the box way to use this die! Love it! Oh wow! I LOVE this box! Great ideas in how to use it! Thanks for the chance!! Very fun! And yes the dies are awesome! Such great inspiration! Would love to win the Cutie Pie Thinlets set! Love the versatility of these “cake slices”…would really love to win this great product! You have the best giveaways!! Thanks for sharing!! Thank you to Stampin’Up for you generous donation for this giveaway! The die set is awesome and would make some fun things for my grandchildren, and the kids at work! What creative ideas and cute projects, thanks for the chance! Wow the sparkling diamond looks amazing. I love seeing the Stampin’ Up! Showcase. Always great products and ideas. This is one of the cutest sets I’ve seen lately. Thanks for the chance to win it. These are darling. This is high-quality creativity. I can’t decide which one is my favorite. They are all fantastic! Wow! These are so bright and fun!!! would love to win–so much fun! thanks! What a fun way to give birthday favors and it looks much more versatile. Love her examples. Thanks for the chance! Would love to win this prize — cake or pie slices can be used for EVERYTHING. Thanks for the opportunity to win. Love all of these dies from Stampin’ Up . Thanks for the chance to win. WOW! Love all the different projects from one die set. The diamond and party hats are adorable. Great idea. Congrats to the winner of last week’s giveaway. What a fun set. Love those sweet cake boxes. To sweet, as is the hat. Thanks for sharing your great ideas. WOW – EXCITING dies and projects!!! Wow! What fun ways to use this die set! Really love the snowy mountains! Oh my goodness, that cake box is the cutest ever! Thanks for the chance to win. Such a great set and thank you for offering this wonderful giveaway! What cute and wonderful ideas! Such creative minds at work! Oh how fun! So many possibilities. You could make the cake pieces as keepsake place cards, a gift box, a banner – just name it! Thanks for the inspiration and a chance to win! What a fun projects! The party hat is my favorite. LOVE this die by Stampin Up! It’s so unique and thanks so much for sharing these ideas on how to use it in different ways!! Great inspiration! What a great set of dies! I don’t have anything like these and can think of some great ways to use them! I also live close to the Rockies, so your mountains made me smile! I look forward each month to the Stampin’ Up! Inspiration Saturday post! This feature always showcases something wonderful! It’s fun to see products being stretched and used in incredibly creative ways. I’ve had the Cutie Pie dies on my wish list since I first saw this set. They create the perfect addition to any special celebration. Thanks Stampin’ Up and SCT for this great monthly feature, and the opportunity to win such a generous giveaway! Fabulously creative projects created with this die set! I just love dimension! Those cake slices would look great as decorations at my daughter’s 9th birthday in October! Thank you for the chance to win this! Happy weekend! What a variety of fun projects you can make with this fun die set! Thanks for the chance to win and all the tips and hints. My two little girls would love party favors made with this great giveaway! Wow! Cake slices that I won’t gain a pound!!! Thank you SCT and SU for the opportunity!! Oh, how cool is that versatile set. Would love to win – thanks for the chance. Wow!!! Fabulous products from SU! All the projects are Amazing! I just love this cake die and all the project possibilities! They would make the cutest party favors! What great projects!! Love the many uses for these! This die set is so fun and the favor boxes are adorable! Love how creative the DT is and would love to win. What a cool die – and you’ve given so many fun ways to use the die set. Thanks SCT and Stampin’ Up! Great projects! Love the die!! I love baking and paper crafting. These framelits are the perfect combination of the two! Those are so fun!! I love Stampin up and would love to win!! I love the little slices of pie. Adorable! Always tons of ideas to inspire me at Stampin Up. GAHHH!!! How adorable is this die!!! Seriously SCT…you guys are always amazing and so generous!! Thanks for the chance to win and good luck to everyone!!! How cute! What a fun project! That looks like a very versatile kit. I love all the little extra dies that Stampin’ Up always includes. These can be used for so many other projects as well as the major die in the kit. The cake pieces are so cute. The alternative projects are so creative! Fabulous tools to take us to new horizons!! Wow! Love the dies and these projects are really stunning! Great ideas for a funny party! Thank you for sharing! These little cake pieces are adorable! Thanks for all the additional ideas for using them. Love the versatility of this thinlites set!! so many fun ways to use these dies. Thanks for the opportunity to win this lovely prize. Let them eat cake! Let’s scale a mountain, let’s have some creative fun with StampinUp Even make some diamonds…love love love these thinlits!!! Love the possibilities of StampinUp and SCT together. Thank you. Sharon k.
I never thought this set could be so versatile! Great job by Allison – “shining bright like a diamond” is all I can think of! What a great opportunity to win a great set. Great prize lots of ideas for wonderful projects. I didn’t realize that Stampin’ Up was selling these! Will have to go take a closer look. They look amazing!! Thanks for all the great ideas–love how you guys can always think out of the box and make something 10 different ways!!!!! What a great die cut set! Love how the cake turns into so many different objects! Such wonderful ideas Allison! Wonderful ideas!!! Love your diamond, very chic and oh so fun. I would love to win this very versital set. Thank you for a chance to win. I don’t actually own any SU product yet (I know, unbelieveable). But that cake box, as a cake is so sweet. Then to see those other ideas – wow! I’m in love with the party hat (with that sentiment). These projects are really great Alison! What a versatile die! Can be used for many projects! Such as a Halloween witches hat. Thanks for donating this giveaway. Love how you used the set in so many different ways. This set has been on my wish list for a while now, and i never tought i could use it any other way than just a cake. lovely projects and thanks for the amazing prize!